As high school students they were the youngest to win the gourmet food industry's highest award, they appeared on The Martha Stewart Show, were one of Martha Stewart's Best Desserts 2008 and selected for Oprah's O-List online. Now the teenage entrepreneurs have opened their first retail store and toffee factory. After four years of toffee production, valley favorite Brandini Toffee announces the Grand Opening of their first retail location. A ribbon cutting ceremony will take place on December 7th, 2009 at 1:30pm and the mayor of Rancho Mirage will be in attendance. The 5,200 sq. ft. facility features a display production kitchen and packing area, retail toffee case and plenty of pictures of the Brandini Kids. The toffee shop is located at 42-560 Bob Hope Drive in Rancho Mirage, CA on the corner of Highway 111 and Magnesia Falls Dr. 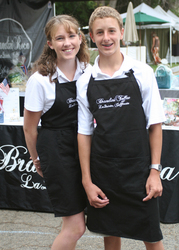 Both Brandini Kids will be back from their freshman year of college to attend the ribbon cutting ceremony and hand out samples of Brandini Toffee. All products will be discounted by 20% for the Grand Opening and tours of the facility will be given throughout the day. 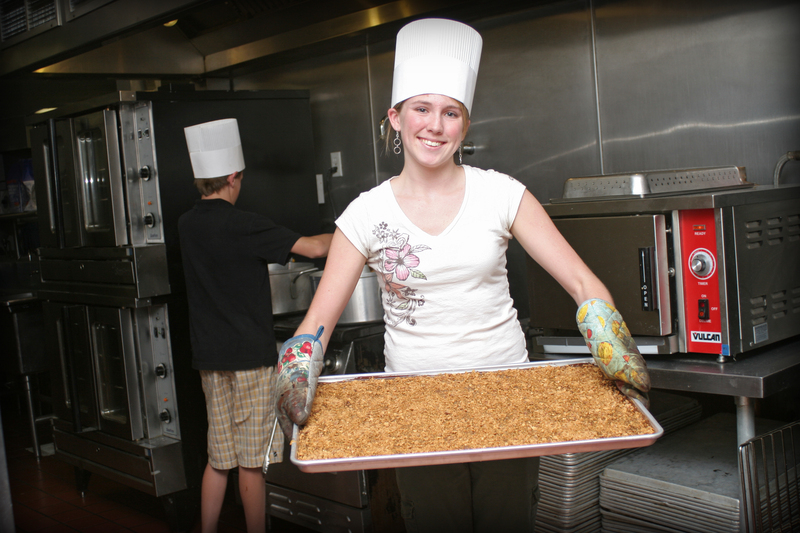 Brandini Toffee was an idea conceived by Brandon "Brandini" Weimer and Leah Post during their sophomore year in high school as a way to pay for a school trip to Italy. They earned enough for tickets and spending money within 6 weeks, a new business was born. 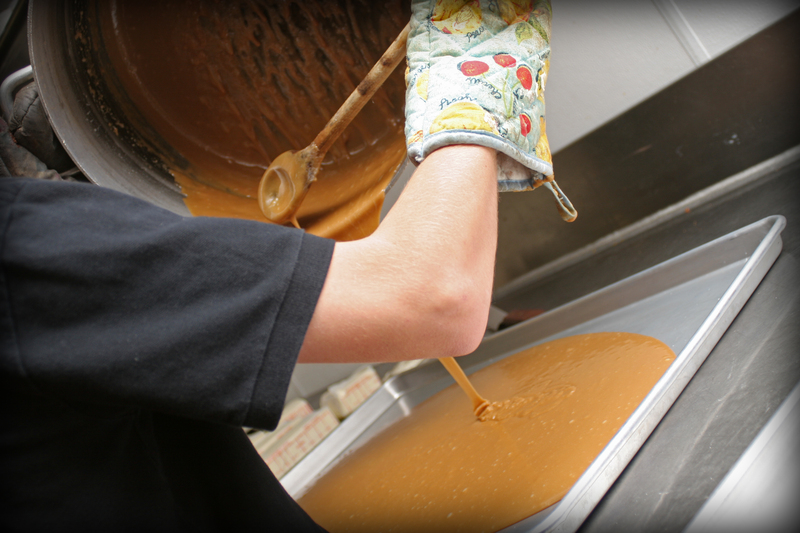 Since its inception, Brandini Toffee has received numerous accolades including Best Dessert 2008 by Martha Stewart. They also appeared on The Martha Stewart Show in early 2008, sharing with their families a once-in-a-lifetime trip to New York. Brandini Toffee was included on Oprah's O-List online in 2008, won the Sofi Gold for "Outstanding Chocolate 2008" by the NASFT, and were voted Desert Magazine's - Best Chocolate Shop 2009 by residents of the Palm Springs area. Brandini Toffee can be purchased online or in gourmet food stores, hotels and wineries from Trump Plaza to Napa Valley. Family and friends also sell at various west coast events and Costco Roadshows throughout Southern California. Leah Post and Brandon Weimer with Martha StewartThe Martha Stewart Show - aired February, 2008 Rome, Italy 2007Challenged by their parents, Brandon and Leah started Brandini Toffee to earn money for a class trip to Italy. 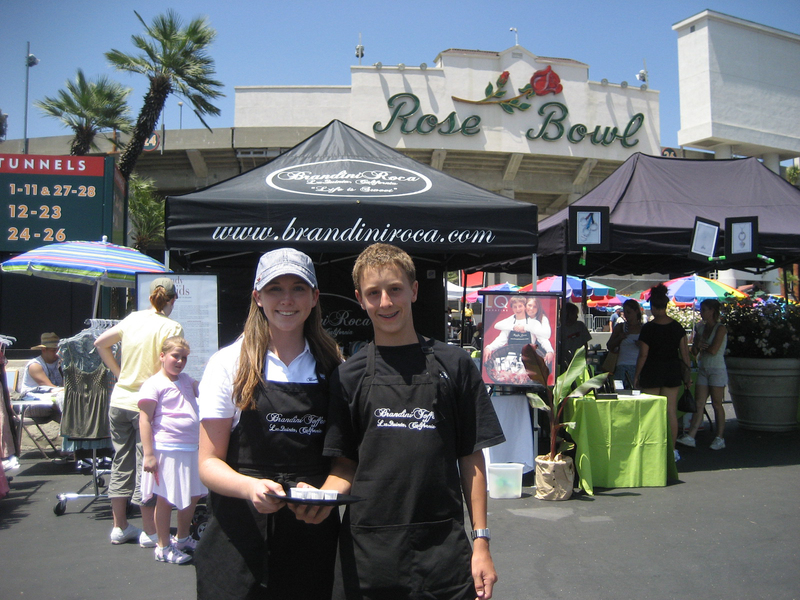 Leah and Brandon selling toffee at The Rose BowlTeenage entrepreneurs sell their award-winning toffee at The Rose Bowl in Pasadena, CA. Making Brandini Toffee: Step 1Brandon "Brandini" Weimer measures out the butter Making Brandini Toffee: Step 2Leah Post pours in the sugar Making Brandini Toffee: Step 3Brandon stirs the toffee... and stirs, and stirs, and stirs... (we now use a large firemixer ; ) Making Brandini Toffee: Step 4Brandon checks the time. Even small batches can take up to 40+ minutes. Leah takes it all too seriously. 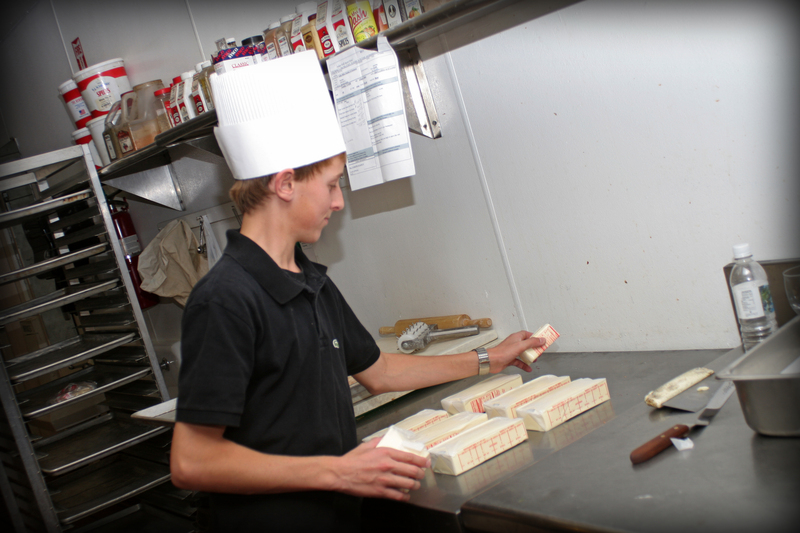 Making Brandini Toffee: Step 5Brandon pours the toffee onto a small sheet pan before spreading evenly. 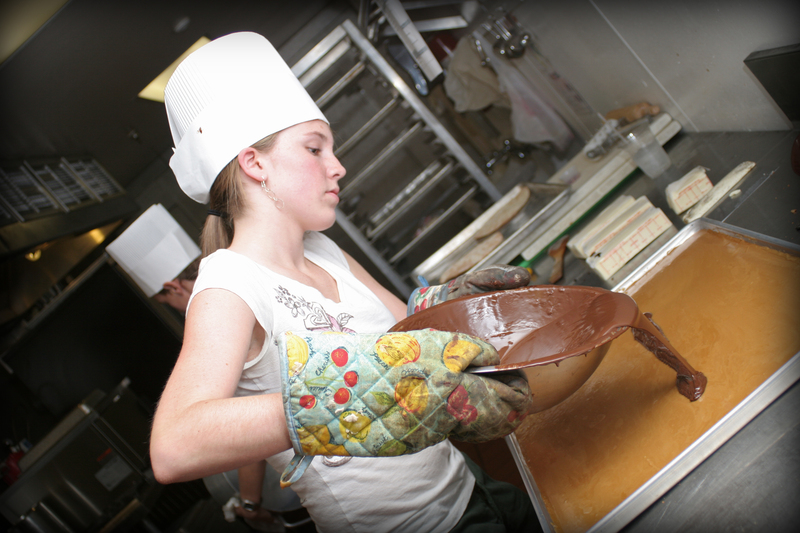 Making Brandini Toffee: Step 6Leah pours a layer of dark chocolate. Temperature is key for maximum stickage. 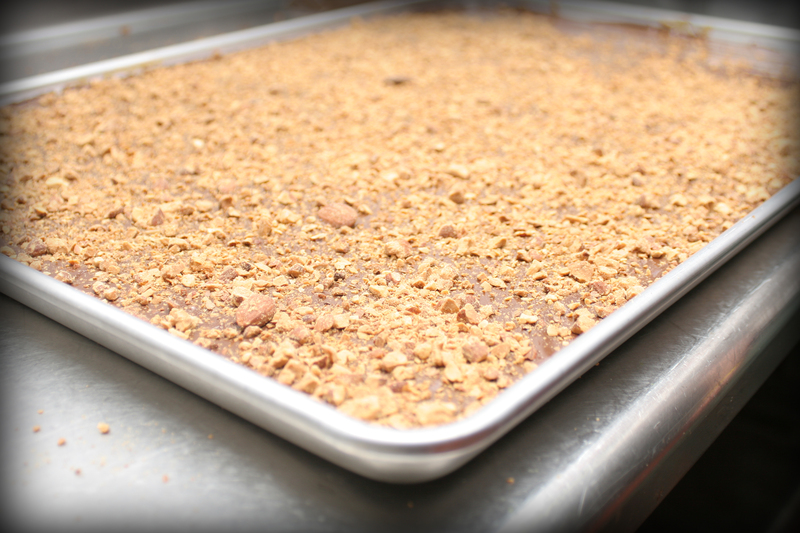 Making Brandini Toffee: Step 7Ground and roasted almonds gives our toffee a nutty flavor with just the right texture. Making Brandini Toffee: Step 8Grinning from ear to ear because Leah and Brandon had a blast making their favorite toffee.